Roti/Chapatti is the plain flatbread and plain paratha is the fried version - we will cover both here. 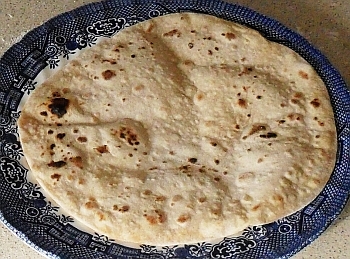 Roti is the dry-cooked Indian flat-bread that is used to eat other meals like curries and so on - Plain Paratha is the fried version of the same thing. 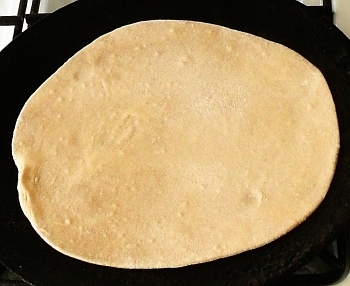 A Chapatti is the same as a Roti, except that it is thinner. In the west, the two names are used as though they are the same thing but a chapatti is thin enough to wrap food in and a roti is thick enough and stiff enough to be able to use a small, torn-off part of as a sort of edible spoon. The preparation of the dough is the same but the cooking is different - although it uses the same equipment. Two will make an addition to a meal. For one meal, you might only want two or if you want three meals worth, then you will need six. Put the flour in a medium-sized bowl, add the water and mix with a fork. 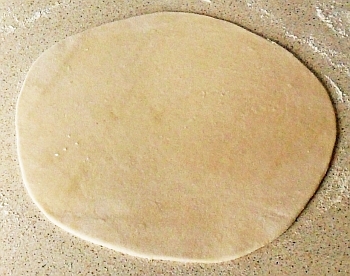 Sprinkle some flour on the work surface and turn out the dough. Break it into as many pieces as you have weighed your flour for and roll them into balls. bit smaller than the tava. 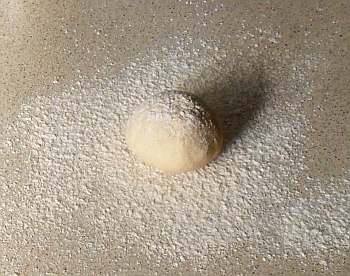 Sprinkle some more flour on the work surface and roll one of the balls out until it is round(ish) and even. You don't have to make them exactly round - in fact, you can make them rectangular to fit into your lunch box and nobody is going to complain. counting 1001, 1002 ... 1019, 1020 and turn it over. 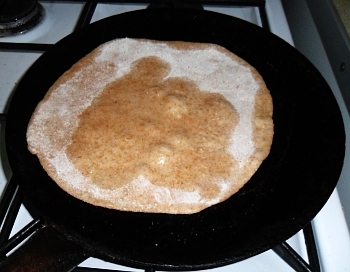 Heat up the tava until it is hot enough so that if you sprinkle some flour on it, it turns brown in around 10 seconds. Put the rolled out roti onto the tava and leave it for 20 seconds. Don't go doing anything else during this time, it needs to be there for 20 seconds only. If need be, count 1001, 1002 and so on. 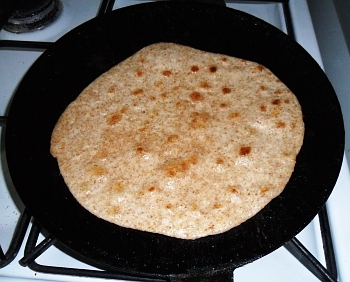 During this time, you are cooking a thin layer of roti. 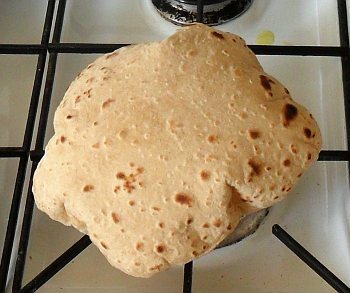 After 20 seconds, turn over the roti and cook it on that side until it starts to bubble. Note that at no time have you used oil in the cooking of this - it has been dry tava in contact with flour all of the time. letting it inflate with steam for a few seconds. Once it has started to bubble, turn it over again and straight away, slide the tava from under it so that it is in direct contact with the gas flame. Within a few seconds, it should blow up like a bag. 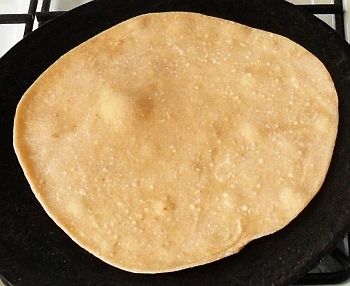 Now, the steam from the dough inside the roti is steam-cooking the bread from the inside. You can use a long pair of tongues to move the bread around a bit if there are any stubborn bits that won't blow up - just move them into the flame. tongues and put it on the pile. Once it is ready, take it from the cooker and put in on a plate to make a pile of them. They are very flexible and will fold without any, or only minimal cracking. Store them in a roti carrier or put them in your lunch box. Eat them with curries, spread pickle on them and fold them in half or do whatever you like with them. some more oil on the top. Put some oil on the tava and heat it up until it starts to smoke. Put the paratha on it and push it down so that it is all in contact with the oil. Whilst it is cooking, sprinkle some oil on the top side so that it can soak and spread around. When it start to bubble, turn it over. Cook it until it bubbles a bit more. You can turn this over repeatedly until it has the right amount of browning on both sides. Store in a cool dry place for a couple of days.